Finnish start-up ICEYE has released a "first light" image from its novel radar satellite, which was launched to orbit last Friday. This will enable multiple radar images a day to be acquired over the same location on Earth - a service that has not previously been available. 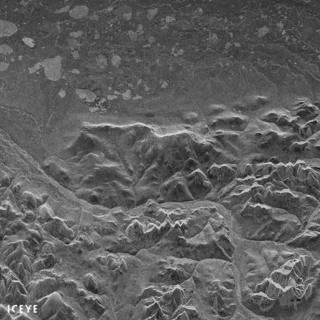 Pictures acquired with a synthetic-aperture radar (SAR) instrument like the one hosted on the ICEYE-X1 satellite show features on the ground even under night conditions and in the presence of cloud cover. It is a powerful tool that the Finnish company wants to make available to new users beyond just the conventional government and military markets. ICEYE believes it can make this happen because of its low-cost approach. One of its suitcase-sized satellites can be made for a couple of million dollars versus the more than 200 million price tag that would be common for its large predecessors. ICEYE-X1 went into orbit last Friday aboard the Indian space agency's Polar Satellite Launch Vehicle. The first light image just realised was taken on Monday. "With this single image, the ICEYE-X1 mission is already a full success regarding our most important goals, but this is just the beginning," said Rafal Modrzewski, CEO and co-founder of ICEYE. "We are now working to increase the range of incidence angles and to more than double the ground resolution for ICEYE-X2. We are looking forward to launching our next mission as soon as this summer."